Continuous high temperature graphite furnace is a new high temperature graphitization furnace developed on the basis of its existing horizontal super-high temperature graphitization furnace, which is mainly used for high temperature treatment of graphite powder purification. Its use temperature as high as 2800 ℃, and hours of continuous work. High production efficiency, energy saving energy saving. With the on-line temperature measurement and temperature control system, the temperature in the furnace can be monitored in real time, and automatic adjustment is made. 1. The temperature is as high as 2800 degrees, the temperature uniformity is good, the constant temperature zone is long, and the failure rate of the equipment is low. 2. Long service life of the furnace tube, continuous production for 20-30 days. 3. With infrared temperature measurement and temperature control system, the temperature in the furnace can be displayed in real time and the product quality is stable. At the same time to ensure product requirements. 4. Three-phase power supply mode, three-phase power balance and stable performance. Unlike carbon tube furnace, single phase power supply, phase voltage imbalance, large impact on power grid, affecting other equipment operation. 6. Automatic feeding device is adopted to control the incoming and outgoing materials, high degree of automation, low labor intensity, and consistent high temperature processing time. 7. Carbon felt is used as insulation material, and carbon black is not used. It is convenient to replace carbon pipe and clean and hygienic. 8. The production mode of pushing boat can be used continuously for continuous production. 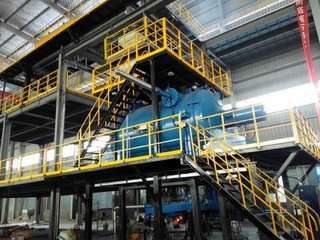 Unlike the interstitial (vertical) furnace, there is no furnace to be stopped for every furnace, and the material can be removed after cooling, and the production efficiency is low and the energy consumption is high. 9. The material is in the boat, and the material will not be contaminated twice. 10. The product quantity of each boat is about 1.5kg, and the product quality can be detected in time, and the process can be modified according to the test results, without stopping the furnace, and the waste of materials is also small. 11, short heating time, up to 200 ℃ / hour. 12. Good sealing of furnace body and small protection of gas loss. All flange and furnace cover are sealed with a seal. 13. The inner tank and flanges of the furnace are made of stainless steel without rust and long service life. 14. The vacuum pump is equipped with the replacement of gas in the furnace, which has short ventilation time and less gas consumption.